This is currently the best moonlight available for fresh and saltwater aquariums. 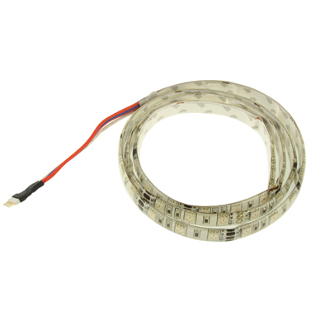 THIS IS FOR THE LED STRIP ONLY, IF YOU WISH TO PURCHASE THIS INCLUDING THE DRIVER AND REMOTE, PLEASE SELECT THIS ITEM. additional moonlighting strips? This is your answer! Make this any length, simply cut it to length across the copper with kitchen scissors. Comes with silicone coated water resistant flexible RGB LED strip with 3M adhesive backing. Length - 1 meter (approx 40") This is bright enough for a 400 gallon tank, remember you can cut it to length or reduce its intensity via the remote control. This is a universal lighting system. Makes excellent ambiance lighting around your home. Place it on top of bookshelves and cabinets for an amazing effect. We have used this as countertop lighting in kitchens by installing it to the underside of the cabinets above the counter top. Very bright! Disclaimer: These units are relatively expensive units being sold at a low price, and we are selling these as a service to our customers. Please be understanding that there will be no warranty for these items as we do not make enough profit to cover a warranty. Like all of our items, they are warranted against complete and total DOA. Up to 3 single LEDs not functioning within the strip is an uncommon occurrence however this is not covered against DOA. (Colors on the remote may be reversed, ie the red button may change the light to blue, this is not covered by the DOA warranty) Thank you for being understanding about receiving this outstanding moonlighting system at an amazingly low price, which helps us keep our prices ultra low.